I’m Throwing Out All the Dog Jackets…. Except These! You are here: Home / Reviews / Dog Stuff / I’m Throwing Out All the Dog Jackets…. Except These! I’ve tried so much gear and so many products for Chester and Gretel – like beds, leashes, jackets, foods, etc. – over the years that I feel like I’ve tried almost everything. I’m starting to get to the point where I have our favorite things dialed in. Don’t get me wrong, I like to try the latest and greatest “ooooo shiny” stuff. However, I find very little that I like enough to dethrone our favorite go-to things. Occasionally there are some though. 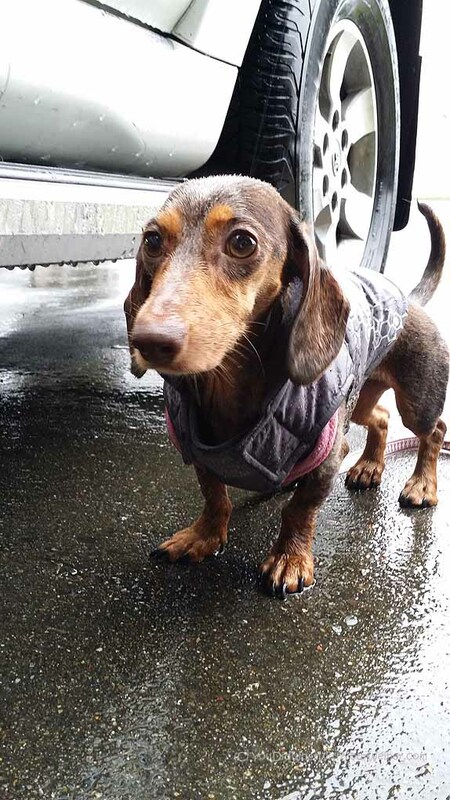 If you are a Dachshund owner, you know it’s really hard to find jackets that fit them properly. It’s even more troublesome to find ones that are good-quality, made of technical fabrics, and reliable for outdoor adventure. If you know me, you know I am a gear hoarder. That goes for myself AND the dogs. I own no less than 5 different backpacks, 3 different sleeping bags, 3 pairs of running shoes, 4 pairs of hiking shoes, 4 rain jackets… and the list goes on. The list for the dogs is long too. I own two dogs but have at least 10 leashes, 6 harnesses, and HAD 16 or so jackets. My favorite jackets for years were the double-fleece jackets from The Cozy Hound. Although you can get them custom made to fit your dog’s measurements, and they are made or warm, thick fleece, they certainly don’t meet all of our needs. They don’t cover Chester and Gretel’s chests or legs, which is important when the temperatures are really cold and/or we are hiking in the snow. They are also not waterproof and, as you know, it rains a lot in Western Washington. I still very much like those jackets but they aren’t ideal for longer, wetter adventures. The Cozy Hound jackets will remain a favorite at my house. However, there is a new jacket it town that has blown me away. Or rather, a newly-discovered brand that has a couple of jackets we can’t live without. These jackets are made by Hurtta. Hurtta is a brand from Finland. They are like the “North Face” or “Mountain Hardwear” of the dog world. They’ve been around since 1973 so they’ve had a long time to perfect things. Their products are stylish and very well made. Hurtta takes into account the build and movement patterns of different dog breeds to come up with products that are ergonomic, functional and match the needs of the dogs. Houndtex®, their proprietary high-performance fabric, is very similar to Gore-Tex – the waterproof layer used in high-quality rain clothes for humans. 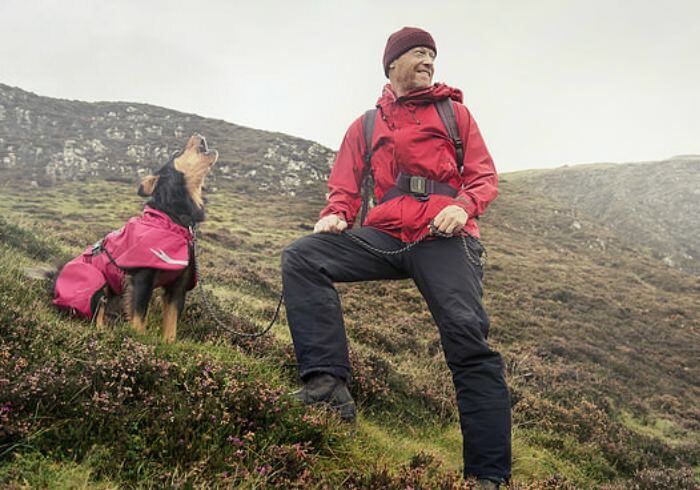 Houndtex is wear resistant, breathable, windproof, and waterproof. Like the human-equivalent rain jackets, the seams on Hurtta jackets are taped to guarantee impermeability. Houndtex waterproof fabric is smoother, softer, and quieter than a lot of waterproof laminates. This significantly improves the comfort of use, especially for small dogs and dogs unaccustomed to wearing garments. Official Hurtta ambassadors include Surf Dog Ricochet and the KMA Kennel Iditarod Team. Unofficial ambassadors – who Hurtta generously provides gear and jackets to for their adventures – include us, Yuri and Kina from Tails from the Trails and Zoe and Phoenix from ZoePhee’s Adventures. When I say I “newly discovered” Hurtta, I mean in the last year or so. I was so used to dog jackets not quite working for us that I wanted to be really, really sure I liked them before I shouted it from the rooftops. Well, I can say we’ve been using these jackets for over a year and I like them more and more as time goes on. I like them so much that I’ve decided to throw out (well, donate anyway) almost all of Chester and Gretel’s old jackets. Now, let’s be honest, the overall number of jackets didn’t really go down that much. In most cases, I have more than one each jacket so we can take one on adventure while the other is in the washer. However, I got rid of all the random jackets we had that never fit quite right, or worked like they were supposed to. 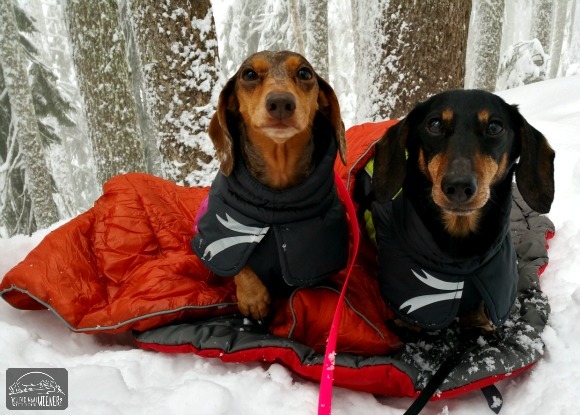 My two favorite Hurtta jackets for Chester and Gretel are the Ultimate Warmer and the Torrent Rain Coat. Both of those jackets fit all of the criteria above. The Ultimate Warmer is soft, warm, and waterproof. It has a thick lining and wraps their body in a “cocoon of warmth” by extending down over their haunches, front legs, and covering their chest. The Torrent Rain Coat is much like the Ultimate Warmer but it’s meant for warmer weather. It only has a thin fleece lining on the inside. Both jackets are pretty adjustable to create a custom fit. Gretel has a 10 inch neck, 16 inch chest, and is about 13 inches from shoulder to base of tail. A size 12 is a perfect fit for her. Chester measures 11 inches around the neck, his chest is 17 1/2 inches and he is about 14 inches from shoulders to base of tail. He’s in between sizes so he sometimes takes a 12 (adjusted to the largest size) and sometimes wears a size 14 (adjusted to the smallest size). I go with the larger of the two sizes for Chester unless it’s so big it causes him to trip up. Visit the lookbook on the Hurtta website to check their stuff out yourself. You can also find them on Pinterest and Instagram. You’ll also want to check out my review on the Torrent Raincoat and the Summit Parka! I looooove Hurtta coats. Only company I’ve ever found that fits my pit bull’s massive front end well enough for hiking double-digit miles comfortably. That’s great to hear. I know Hurtta prides themselves in fitting dogs that typically have trouble. I totally agree! 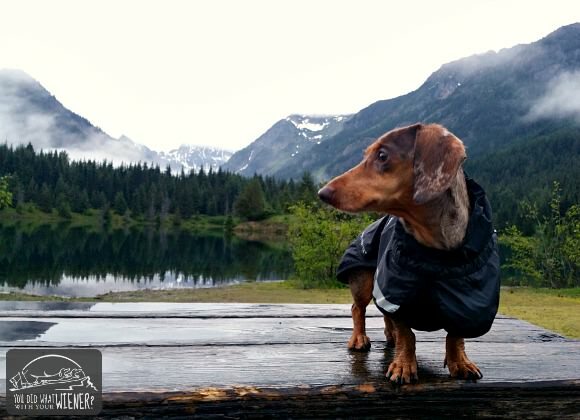 We love our Hurtta jacket for our mini-dachshund! Fits great, easy to get on & off & doesn’t have Velcro (which she hates)! I didn’t even think of the Velcro thing. My dogs don’t mind the sound but I sure hate when grass, dirt, etc get’s stuck in it and I have to pick it out. You can never get all of it and eventually it stops working the same as it did in the beginning. I am not sure what you are looking at but there IS definitely a D-ring on the cooling vest. Maybe you had an older version. It sounds like they are constantly improving things. The life vest has a D-ring too but, you’re right, the jackets do not. I can understand how it’s troublesome to layer with such a small dog. I’ve not had a problem with the harness holes on Hurtta lining up with ours but I have encountered that with so many other jackets. I mean, I guess they can’t accommodate every single harness type out there but it’s so annoying. We are also long dogs but normally we don’t wear coats of any kind. It was hard when Bailie was a puppy and she needed a winter coat that first year. They were all way to short or absolutely huge on her. We totally know how hard it is to find the right fit. The Hurtta ones seem super nice. We’ve seen them on a few blogs and think they would be great if we ever need a coat. Yes, when you actually have dog hair, jackets aren’t as much of a necessity. Ha, ha. Thank you so much for such a great review Jessica. We’ve had Shasta out camping twice this season and he doesn’t really like to get into our sleeping bags when it’s cold (he did cuddle up last weekend after a bit of coaxing) and his jackets are not made for the high altitude temperatures so I’ll be heading over to see about getting him one of these! I really want to try one of these this winter. So far, Ruffwear and Noodle and Friends have been my favorite, but I’m always curious. I’m jealous that Ruffwear stuff fits Nola, especially the Webmaster Harness. I’ve always liked Ruffwear but it never seems to fit right and/or chafes. Now, having seen Nola in person, I am a bit surprised too that it works for Nola and not Gretel. Gretel is actually a bit bigger than Nola. I love Hurtta!!! I recently discovered them too about a year ago and I love there jackets and harnesses! I think their stuff is really well made and thought out. I just saw their new fall release stuff (it’s on the main Hurtta website) and I have to say that I am thoroughly impressed. We love Hurtta, believe it or not my first winter coat is from them. We understand how hard it is to fit Dachshunds especially me because I am bigger as a mixed breed. Mom will definitely check these out if it’s going to be a long winter. Which she is already looking forward to because there’s a horrible heat wave this week. Now if she could only get me to wear a coat! Love Dolly PeeS: Sorry we’ve been absent, need to catch up on how Gretel is doing. Oh, forgot, there is a new resale store in our neighborhood called Re-tails. The aren’t doing consignment any more but sell gently used dog gear. I’ve cleaned out my back porch with a load of stuff to take her. Portions of her proceeds go to charity too. I donate all my old collars and leashes to Petco, take a bag of stuff all the time to their store, they have a collection bin there. That’s great. I take a big load of stuff we don’t want anymore, and stuff we got from events, to the rescue I adopted Gretel from every couple of months. Is the stuff at the store pretty good? I used to love the heat but like it less and less nowadays. I prefer weather in the 60s so fall and spring are perfect….except for the rain. No biggie on not following along with Gretel. I am eternally busy and crunched for time. She was doing good, had a little setback, was back to “normal” but now I am a bit worried again. We stayed at a hotel over the weekend and I was a really bad Mommy. I turned my back for a minute and she jumped off the hotel bed! She’s been skipping her leg a little more walking since then. We go to a rehab gym session today but I’m just going to have the trainer do body awareness exercises with her, not strength/balance ones. I’ll watch her and take her back to the vet if I need to.